In the Anyonita Nibbles house, we love fried rice. Whether it's from a takeaway or made using leftover rice or, like this recipe, made from fresh rice. This rice, though is extra special as it was made with delicious vintage Basmati rice and topped with amazing chicken candy. If you've never had chicken candy, you are going to be in for a real treat! It's delicious and sweet and juicy. If you're looking for a go-to fried rice recipe, then look no further! Don't get so hung up on following it 100%, though. I've found that with fried rice, it's best just to use whatever you happen to have on hand in your fridge. We usually make fried rice near the end of the month when it's time to go grocery shopping again and some of the fresh veggies are nearing the end of their life. Another bonus is that you can whip up this delicious dinner in mere minutes; perfect for busy weeknights! Before, we get to the recipe, let's talk a little bit more about this vintage rice: when I was first approached about it, I had never heard of vintage rice. I didn't even know you could age rice and yield results that people would want to eat! But this rice is delicious! I'm a bit of a rice head, anyway and we tend to buy boxes of basmati at a kilo a time, so there's always some in my kitchen. Needless to say, I was excited to try this rice and elated with the results! I prepared it just as I would normally prepare Basmati (check the recipe below for my tips) and found that it cooked the same if not a little bit quicker than normal Basmati. The most noticeable difference, though is the delicious flavor. I can't quite put my finger on what the exact flavor is, but it's certainly worth trying. The rice comes in a gold package, housed in a beautiful black gift box. Just opening the box was exciting; it was like unwrapping a present! From the initial unveiling to actually eating it, it was a pleasant experience. If I could buy this rice in bulk, I would totally stock up on it and never eat normal Basmati again! Note: you can make this recipe using ordinary Basmati rice, but try it with the vintage rice. You can really taste a difference in the texture of the rice and the natural flavor. It's much more intense! While I was compensated for this post (I was provided with the rice), all opinions remain my own and were not influenced or purchased by this post's sponsor. Preheat the oven to 200C. Rub brown sugar into both sides of the chicken thighs, arrange in a seasoned stoneware baking dish and bake 15 to 20 minutes, until golden. Boil the vintage basmati rice. 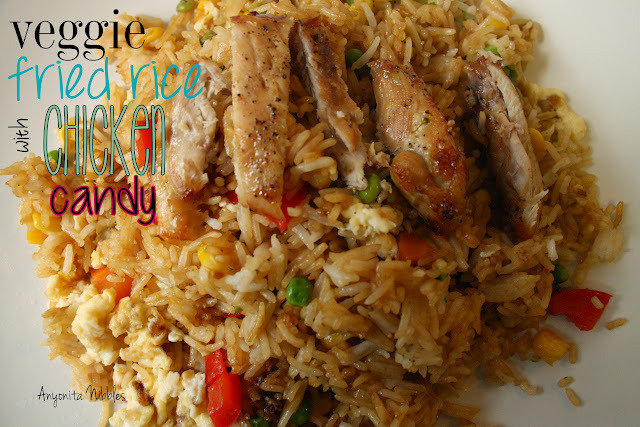 I love this rice, it has such a deep flavor that really lends itself well to fried rice. The best way to cook basmati is to add the basamti to a saucepan along with the water. Leave the lid off and boil away until pencil-sized holes begin to appear on the surface of the rice. At this stage, turn off the heat and allow the rice to finish cooking. You'll have perfectly cooked rice that doesn't stick to the pan! While the rice cooks, fry the egg in a bit of sunflower oil. Set aside and fry the veggies. By this time, the rice should be finished cooking. Sprinkle the rice with 5 spice and fry. While frying, drizzle in the soy sauce and incorporate the veggies and the egg again. Mix well and continue to fry off until rice is golden. 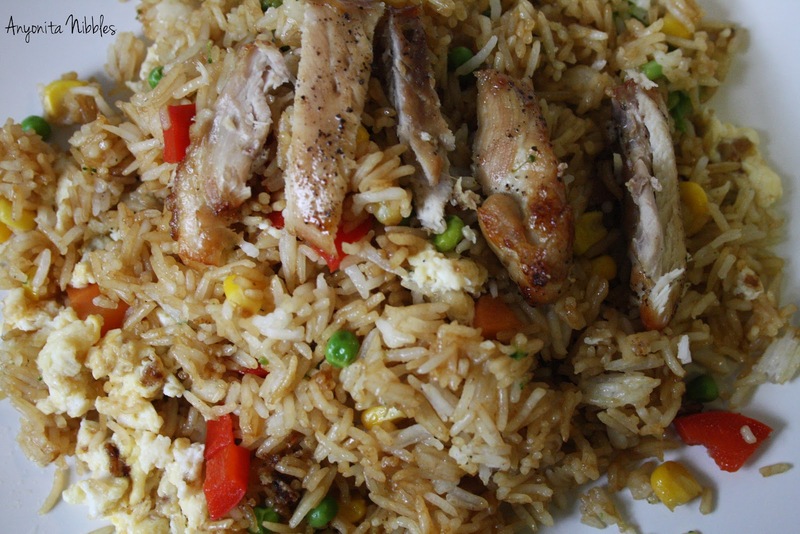 When the chicken has finished cooking, slice it into strips and serve on top of the rice. This dish looks amazing! And who could resist something called "chicken candy" - fabulous. I've not seen that rice before-it looks delicious. The whole meal looks divine! Thank you for linking up to Say G’Day Saturday. This weekend’s party has just started so I hope you can join in again! Aged rice really does taste differently! :) I was so shocked! This weekend has been hectic & I missed your party. :( Next weekend, though! I'll be there!